Google, Apple, Microsoft, and Mozilla have joined hands to create code for use in the future web browsers that promises up to 20 times faster performance. Dubbed WebAssembly (or wasm for short), a project to create a new portable bytecode for the Web that will be more efficient for both desktop as well as mobile web browsers to parse than the complete source code of a Web page or an application. Bytecode is actually a machine-readable instruction set that is faster for web browsers to load than high-level languages. 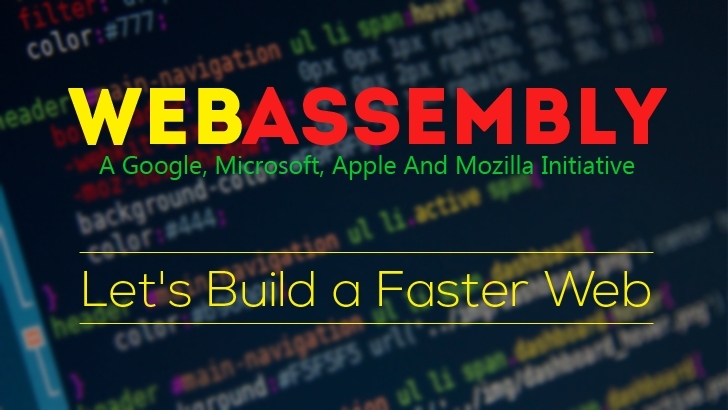 If introduced as a standard implemented in all web browsers, WebAssembly could surely bring app-like performance to Web content as well as applications. "I'm happy to report that we at Mozilla have started working with Chromium, Edge and WebKit engineers on creating a new standard, WebAssembly," said Mozilla developer Luke Wagner, "that defines a portable, size- and load-time-efficient format and execution model specifically designed to serve as a compilation target for the Web." Currently, only C and C++ code can be compiled into a WebAssembly (a.k.a wasm) file. WebAssembly is still in its early days of development with no formal standards as of now. The specifications and the high-level design has also not decided yet, but with all four major browser developers working together, wasm should appear soon. The future possibilities for WebAssembly file format are being explored on GitHub page. However, a new WebAssembly Community Group has already been formed by the World Wide Web Consortium (W3C), which is open for anyone to join. These are FAQs that will give you more details on the group plans.